No Fear of the Future: Socialist Republicans of the World, Unite! Did anyone see the first season of 24, back in the weeks after 9/11? The central plot device was a plot to assassinate the first African-American candidate for President of the United States. Kiefer Sutherland frustrated the plot, orchestrated by mysterious factions with moles inside the U.S. government, at the cost of his own wife's life. Seven years later, the plot device of the first African-American candidate for President of the United States is the sinister theme of the first campaign advertisement to openly model itself after an episode of 24, complete with the dark digital horror track music and the creepy associations with covert agents of terror lurking in the house next door. In a similar tone, the Drudge alumni over at Breitbart conduct a lengthy McCarthy style "investigation" of Obama's relationships with a bunch of Chicago-area lefties — trying to scour the Web to determine whether or not Obama was a "member" of "the Party." The shocking revelation is that some of these folks Obama was close with at the beginning of his political career in the mid-90s espouse socialist views. They may even believe that our banks should be nationalized? There were shouts of "Nobama" and "Socialist" at the mention of the Democratic presidential nominee. There were boos, middle fingers turned up and thumbs turned down as a media caravan moved through the crowd Thursday for a midday town hall gathering featuring John McCain and Sarah Palin. "It is absolutely vital that you take it to Obama, that you hit him where it hits, there's a soft spot," said James T. Harris, a local radio talk show host, who urged the Republican nominee to use Barack Obama's controversial former pastor, the Rev. Jeremiah A. Wright Jr., and others against him. "We have the good Reverend Wright. We have [the Rev. Michael L.] Pfleger. We have all of these shady characters that have surrounded him," Harris bellowed. "We have corruption here in Wisconsin and voting across the nation. I am begging you, sir. I am begging you. Take it to him." The crowd of thousands roared its approval. In recent days, a campaign that embraced the mantra of "Country First" but is flagging in the polls and scrambling for a way to close the gap as the nation's economy slides into shambles has found itself at the center of an outpouring of raw emotion rare in a presidential race. In case you hadn't figured it out from the rabid rallies screaming for blood, negative ads work, tapping all of our deep, evolutionarily-wired fears and tribal affiliations. Advertising Age just did a study (three-minute video podcast here) of the impact of different types of political advertisements on viewers, relying upon the "facial coding" techniques of Dan Hill of Sensory Logic, a firm that specializes in analyzing the psychological responses revealed by facial muscles (apparently even blind people exhibit the same basic facial expressions as the sighted for different emotional responses, demonstrating that these things are physiologically wired products of our long evolution). The study had a group of viewers watch two ads from each candidate, one positive and one negative. 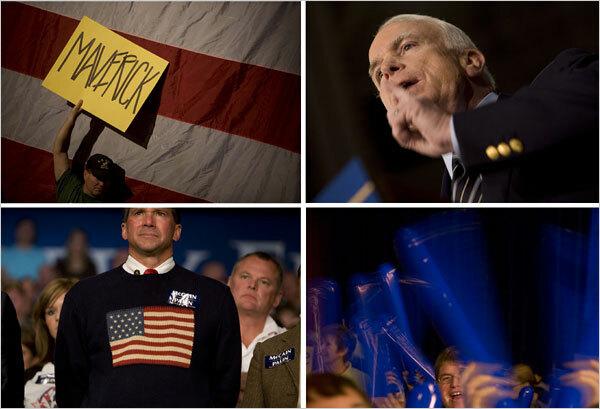 The positive Obama "hope" ad received a much better response from the viewers than the McCain "change" ad. But the negative McCain ad (specifically, the Britney Spears ad) was five times more effective than the positive Obama ad. One can only imagine the impact of the Osama, I mean Obama, sleeper agent friends with terrorists Chicago machine dark alley ads. Interestingly, the facial recognition folks maintain a "Face of the Week" blog that analyzes figures in the news. See, for example, the March 2008 clip from Ben Bernanke revealing that, as he told Congress he believed the economy would pull through without a recession, he didn't really believe it. While the elite GOP counterrevolutionary cadre tries to pump its coagulated Reagan-era rhetoric through the pneumatic tubes, the Republican Treasury Secretary is using his newly conferred powers to nationalize the banking system and significant chunks of the capital markets, and the mainstream media is openly dusting off the Cliff's Notes copies of Das Kapital stuffed in with the other 1970s college textbooks and questioning whether Western-style capitalism has run out of gas. Remember the End of History? Yesterday, coming on twenty years later, the leaders of the West were sitting around a table talking about whether they should indefinitely suspend the financial markets while they figure out if they can get the needle back on the record. Crowds in Wisconsin and Pennsylvania have repeatedly booed Mr. Obama and yelled “off with his head,” and at a rally in Florida where Ms. Palin appeared without Mr. McCain, The Washington Post reported that a man yelled out “kill him.” At the same rally, a racial insult was hurled at an African-American television cameraman. It's not the end of history. But it is the end of the anachronistic white man's fantasy of an eternal 1950s version of America. And it's an ugly thing watching this cultural toxin work its way out of the system. "Country First." WTF? What kind of alternate reality Bizarro America are these people occupying, Sarah Palin as some kind of cross between Jeane Kirkpatrick and Ted Nugent? Among Palin's most notable recurring soundbites is her weirdly naive vaunting of American exceptionalism. "But even more important is that world view that I share with John McCain. That world view that says that America is a nation of exceptionalism. And we are to be that shining city on a hill, as President Reagan so beautifully said, that we are a beacon of hope and that we are unapologetic here. We are not perfect as a nation. But together, we represent a perfect ideal. And that is democracy and tolerance and freedom and equal rights." 3. environmental explanations such as geography, climate, availability of natural resources, social structure, and type of political economy. News flash: the City on the Hill is crumbling under the weight of its own rhetorical fabulism, collapsing like Mordor on the foundation of its own explosive weaknesses. You don't need the Weathermen to blow up the State when it's blowing itself up. The most remarkable thing about the current crisis is the extent to which it demarcates a dramatic undermining of any idea of the post-World War II superpower version of American exceptionalism. The government owns your mortgage. It may soon own your bank account. Together with our sons of Churchill allies. There's even odds the big three American auto companies will not survive past Christmas, at least in their current form. Our Constitutional system is evolving to harbor a structure more like Putin's corporatist state than Ronald Reagan's New Federalism. Goodbye nation state, hello market state, welcome a realigned world of governance by a coalition of sovereign hedge funds protected by corporate mercenaries. The Kwisatz Haderach and his Democrat Archons, as much as they try to represent the future, are just about as dumbfounded as the Bushies, dusting off Walter Mondale fantasies that there's no problem a little Washington regulation can't fix. This chaos isn't about what "leaders" do. It's about the hundreds of millions of decisions each individual makes about how to respond to this opportunity for change in they way they live their lives. Was mich nicht umbringt, macht mich stärker? Perhaps this collapse of the late twentieth century American meta-narrative is the opportunity for a 21st century remix of old school American ideas of individualist liberty, a more libertarian variation of the system that gives up on trying to preserve the Ward Cleaver anachronism in a multi-colored, multi-polar globalized world. When Viggo and the kid find the ruins of Pleasantville, no doubt they will improvise a new version that marries the past with the future. What will life be like on the other side, in our New Tocqueville?